Valentin Aleksandrovich Serov was born and grew up in a creative environment. His parents formed a famous musical tandem: father is a composer and mother is a pianist. In their house people of art of the most different directions gathered. Noticing her son’s interest in the visual arts, his mother sent him to study in Paris. There, already renowned Russian painter Ilya Repin became a tutor and close friend of Serov. Subsequently, he recommended Serov to study in St. Petersburg. However, he, not having finished his studies, is given to free creativity. Valentin Aleksandrovich paints pictures on a variety of subjects. Critics and spectators favorably accept his work, characterized by lightness and airiness, ease and deep philosophy. Being engaged in teaching at the Moscow School of Painting and Architecture, the artist created magnificent paintings and even managed to write posters for theatrical productions. Valentin Aleksandrovich was constantly close both to theatrical and musical communities. This was due to the environment in which he grew up, and inherent in the time in which he lived. Then, at the end of the 19th century, the main appeals in art were the blurring of the boundaries between its individual species and forms. Anna Pavlova was inimitable and became a symbol of Russian ballet at the beginning of the twentieth century. Her strength was the fragility and virtuoso dance performance. Valentin Serov portrayed her exactly as light as a feather, perpetuating in her portrait the “silhouette of the silver age” – the fusion at the turn of the century of the classics and the modern. 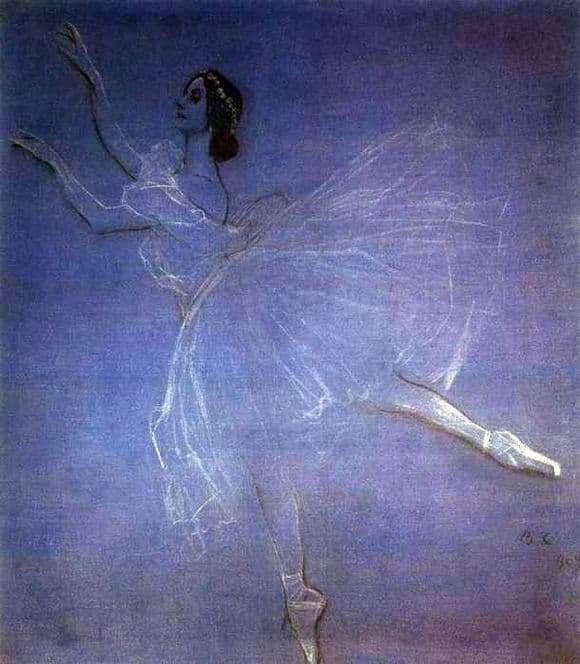 Without bright colors, superfluous lines and details, the artist created an immortal, subtle and sophisticated image of a great ballerina, who now seems ready to start spinning with a warm playful sparkle, like a white feather in the wind.